In any type of survey, a researcher asked various questions to the people in order to get a proper result. Before planning the questions for the survey work, a surveyor needs to take consent from a particular authority. 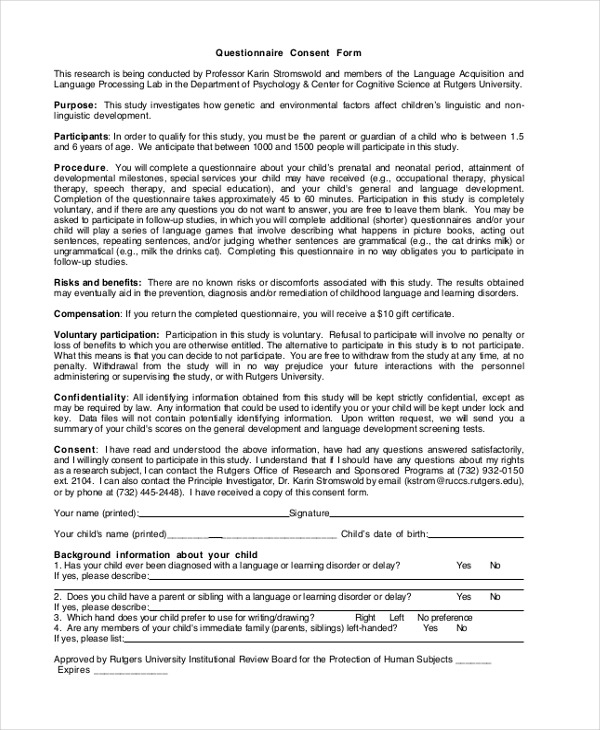 This form can be used to get consent over questions on the survey. The form is accepted universally for all kind of research work. Survey is often conducted on immunization and therefore various questions are asked to get a proper result. 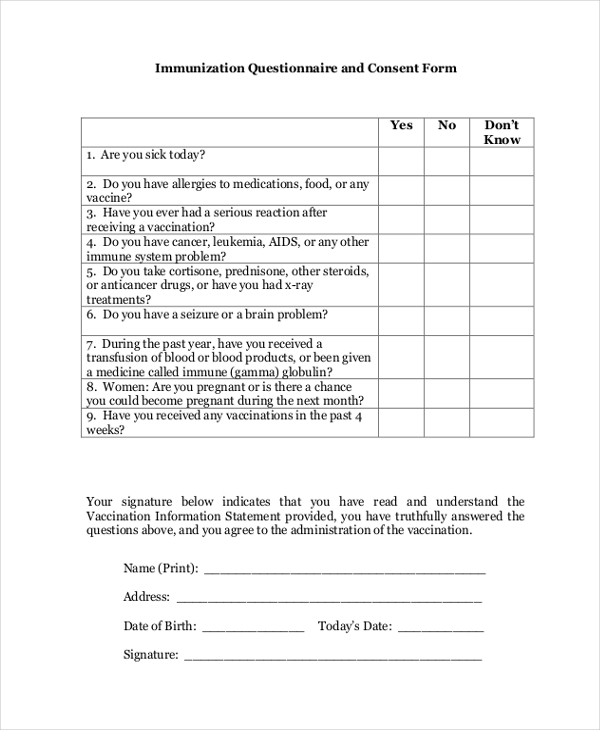 This form is used to get a consent form of a particular authority for creating the final questions for an immunization survey. This is a sample which is used for consent on various questions asked in a survey. 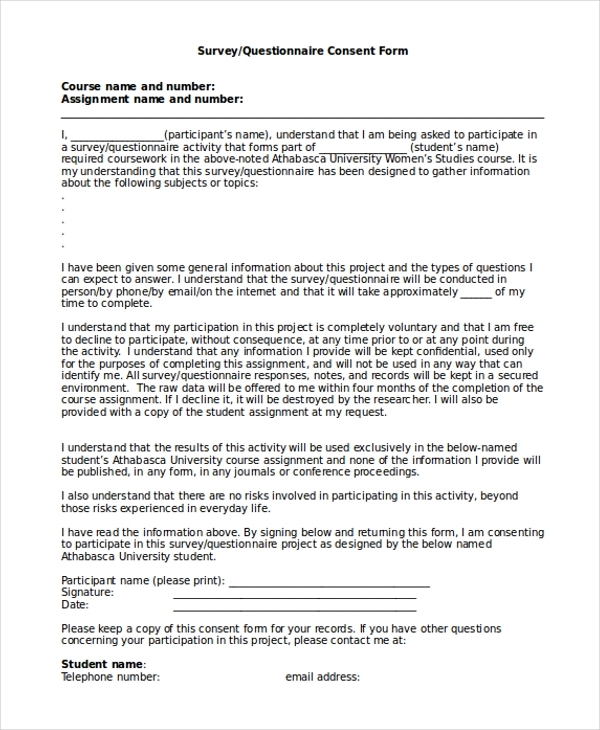 This from can be used to get consent on any type of questionnaire that is needed for the survey. 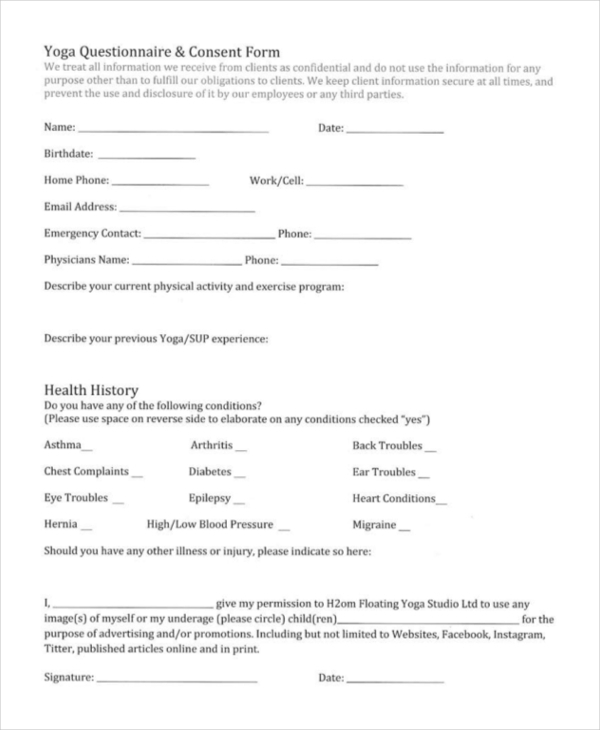 This form is mainly used to collect information about clients who practice yoga. The form has been customized with all the information that is needed for doing a survey on yoga enthusiast. The form contains every type of information like personal details of the clients and most importantly the health details. The form is mainly used for vaccination purpose. When a survey gets conducted there are certain questions which are asked. The form has been customized with all the details of the various questions that are asked. By analyzing the answers from the questions asked in the form, a surveyor can find out the end result. 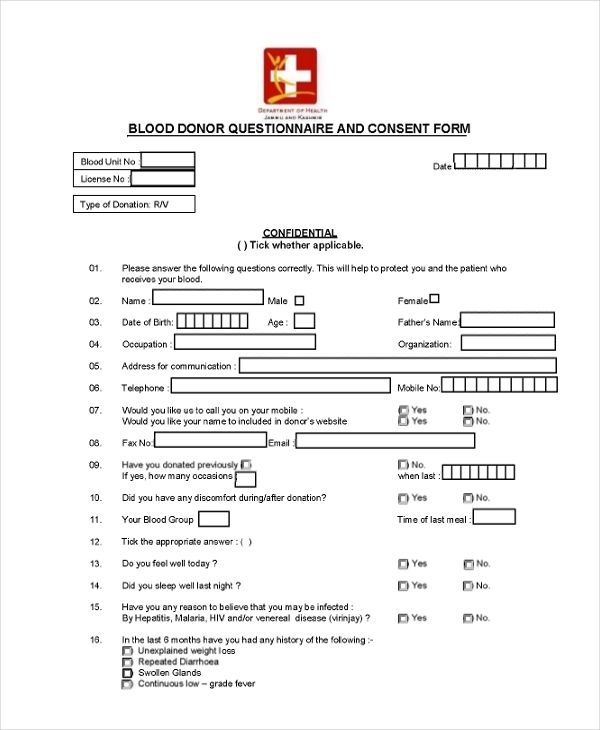 This form can be used for conducting a survey on blood donation. Many a times surveys are conducted on the matter of blood donation and this form can be used to do such surveys. The form is filled with every kind of questions that are generally asked in such surveys. 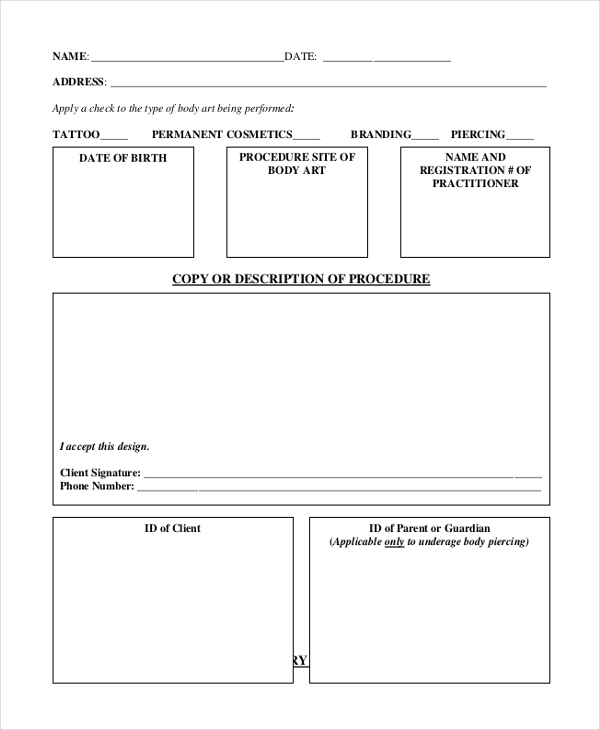 This form is used to get a report on various clients who comes to the body part. The form contains every type of health information of a person. Mainly this form is used as an archival value of the client. All the details are there in this form and based on this the various body parts performance. 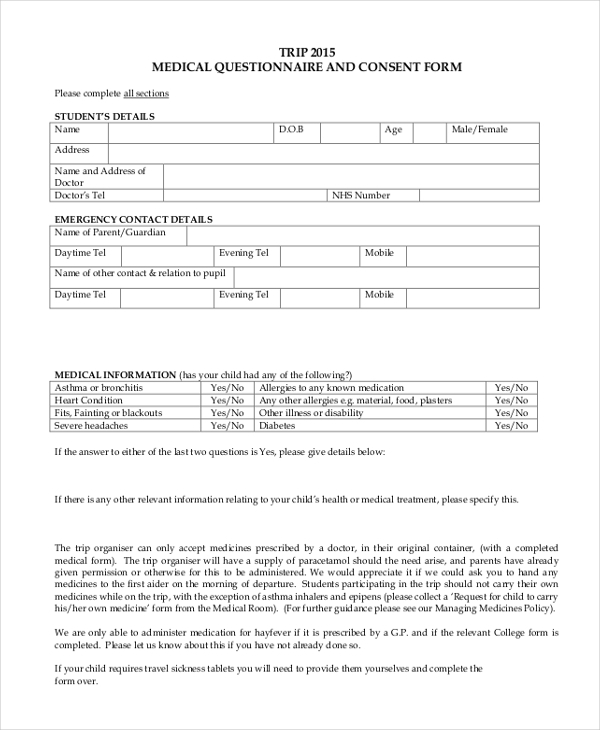 This form is mainly used to keep a record of the medical history of a student or any other person under an organization. The form contains every medical detail of a person or student. This is mainly used as a record to serve future purposes. The form is mainly used for keeping records of the new students getting admission in a school or college. Every organization keeps a record of the students taking admission. Certain information is kept as a record like personal details, medical details, educational details etc. 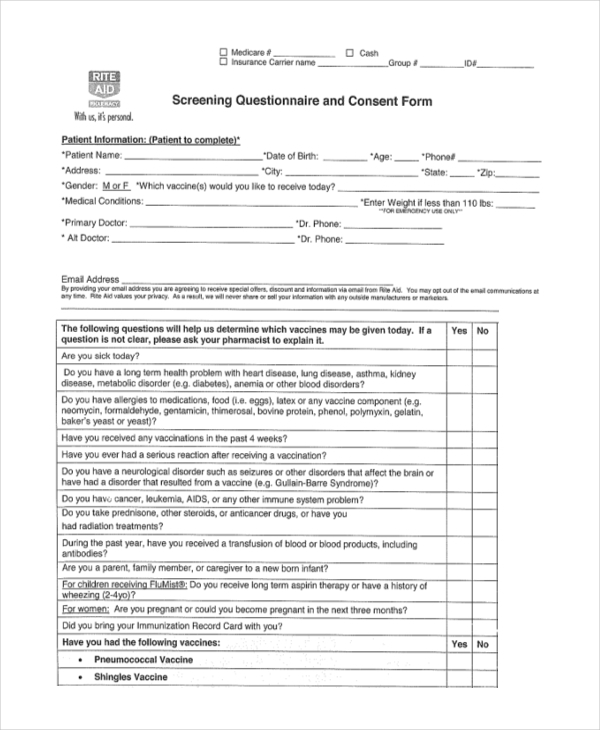 What is a Questionnaire Consent Form? It is a legal document for the questionnaire. This form provides an easy way in conducting a questionnaire survey in any every field. The target audience of this particular form is all the people working under an association and is legally responsible for getting back the amount spent on travel or in tuition fees. There cannot be any such group of people for this particular form. Every person who travels and is liable to get a reimbursement on the traveling amount by using this form. The only productive purpose of this particular form is to frame questionnaire for various kinds of surveys. Every organization uses this form for the survey. The questionnaire consent form is the only easy and best method in dealing with questions asked in a survey. More or less in every field while conducting a survey, this form is used for framing different questionnaire.